One tree on campus seems not to know the season. Mariah Doughman ’18 (pictured) is working with David Poister (Chemistry, Environmental Science) to find out why. When autumn leaves turn bright shades of gold, orange and red, most of us simply appreciate their beauty. But chemistry grad Mariah Doughman ’18 isn’t simply enjoying the view nowadays. She’s thinking about exactly why and how those colors appear during Mother Nature’s annual art display. Doughman teamed up with David Poister (Chemistry, Environmental Science) for a collaborative research project. Their focus: determining whether a carotenoid pigment in a Norway maple tree on campus was increasing in concentration during the fall. Poister can see the tree from his window in the Gehl-Mulva Science Center. He became intrigued when a research study for one of his chemistry classes started turning up some unexpected results, just on that one particular tree. “He found that the concentration of a certain carotenoid pigment was increasing during fall, which was pretty unusual,” explains Doughman. To understand what makes the finding so strange, you have to understand how leaves normally change color. Typically, it happens because the green-producing chlorophyll starts to diminish more quickly than the other pigments. When the green disappears, it simply exposes the orangey-yellow pigments that were always there. However, scientists don’t expect to see those orangey-yellow carotenoid pigments increase during fall. 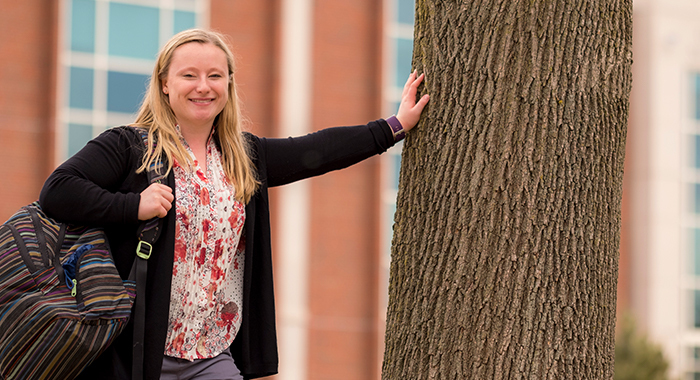 Doughman says she felt a bit conspicuous carrying giant branch trimmers around campus, but she did what it took to collect hundreds of samples of the Norway maple and seven other tree species over an 11-week period. “I had to stop collecting samples on a couple of the trees when the leaves got too high for me to reach,” she says. Doughman freeze-dried her samples, extracted the pigment and then ran them through a process called HPLC (high-performance liquid chromatography) to determine concentrations of chlorophyll and carotenoid pigments. Her results confirmed Poister’s earlier findings: The Norway maple was increasing production of carotenoid pigments. “The next step is to figure out what this pigment does and to characterize it,” says Doughman. There is one question Doughman recalls asking on occasion that provoked a bit of a running joke between student and advisor. “Dr. Poister would always joke, when I asked him, ‘What’s the point?’ He would say, ‘It could be the cure for cancer.’ ” However, Doughman and her advisor stay motivated for a different reason. Whether or not this pigment leads to a “cure for cancer” type of discovery or another world-changing breakthrough, this project has netted some exciting results. Doughman, who is beginning a Ph.D. program in environmental chemistry at Florida International University, has tangible scientific experience to help launch her graduate school career. Poister has made significant advances in his ongoing environmental chemistry research, confirming an unusual and novel finding. And, perhaps best of all, the world might know something it didn’t know before. 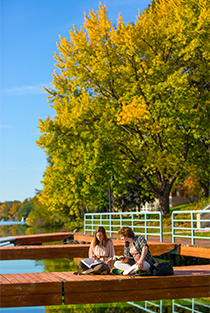 The entire St. Norbert campus is an arboretum, and in the autumn it shows its full array of colors.